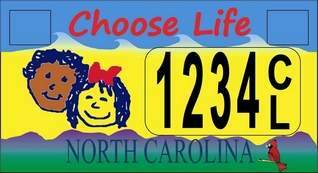 The North Carolina state House has just approved legislation to allow motorists in the Tar Heel State to purchase Choose Life license plates to adorn their vehicles and spread a pro-life, pro-adoption message. The House voted 70-44 to authorize dozens of new specialty plates, including the Choose Life plate, that require an extra $25 fee to purchase — with $15 going to pregnancy centers that provide women with abortion alternatives for each plate sold in the state. Until now, North Carolina was the only state in the southeast that refused to let its citizens purchase the choose life license plate. For eight years the legislation for the choose life plate had been denied a vote even though more than 130 other plates have been approved. This is an awesome step for North Carolina and for the precious lives of the unborn. I am so thankful. And I hope to go and get my plate this week! Thank You for this Victory Jesus!